Jumbo TVs Yearn for Halftime. Ah, that’s better! My brain works in mysterious ways. The Astronomer and I met up with a Danny of Kung Food Panda, Wesley of Two Hungry Pandas, and Christine of Choisauce at JTYH for a midweek feast. Danny was introduced to JTYH by Mr. SGV, Tony of Sino Soul, and wanted to spread the word. I was more than happy to listen. 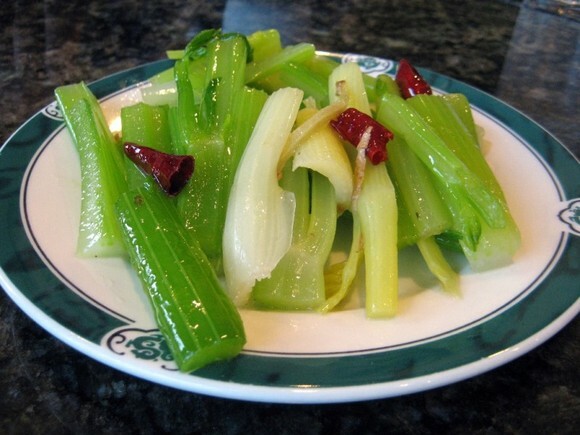 While deciding which delights would grace our table this evening, we were served a plate of snappy celery sticks coated in chili oil. Jazzed up celery sure beats the standard stuff, but truthfully, not by much. 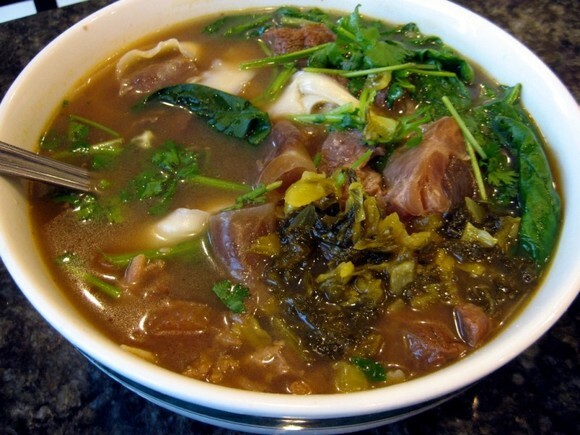 Feeling a bit dumpling’d out, our group stuck to JTYH’s noodle and offal offerings. After we placed our orders, we waited a solid fifteen minutes before any food began to arrive. Accustomed to the San Gabriel Valley’s standard protocol of food rocketing out of the kitchen, we were unnerved by the lengthy lull. Next to arrive was the Beef Noodle Soup ($5.95), which came with a mixture of tendon and regular beef, as well as knife-cut noodles. 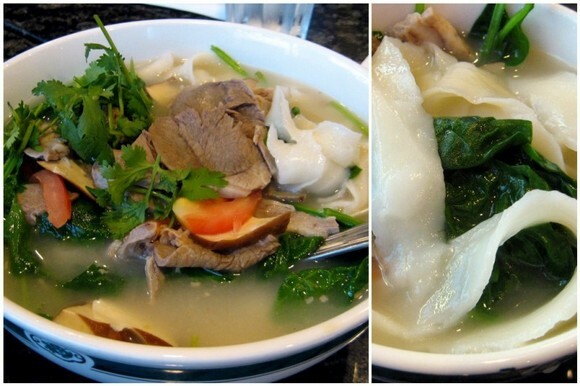 Unlike niu ro mian I’ve sampled in the past, JTYH’s broth was light in both color and flavor. A couple of spoonfuls of chili oil helped it along, but the soup wasn’t budging from its stubbornly mild stance. The most curious item we ordered were the Mooshu “Cat Ears” or 貓耳朵 ($5.75). Not sure what to expect from the menu’s description, I pictured a mock meat type dish made of chewy bean curd. 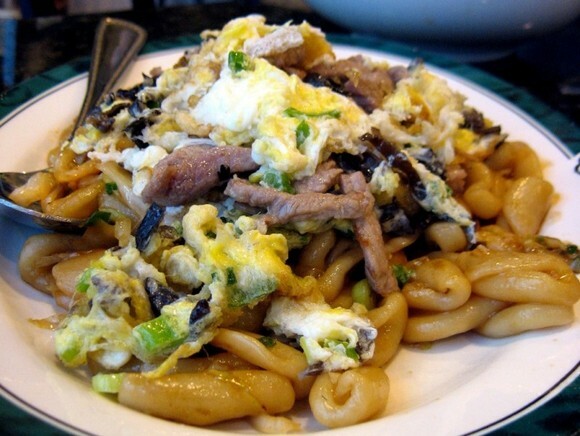 What arrived were miniature orecchiette fried with bits of pork, woodear mushrooms, eggs, and scallions. This dish reminded me of Vietnamese nui chien. Pasta and eggs go so well together. 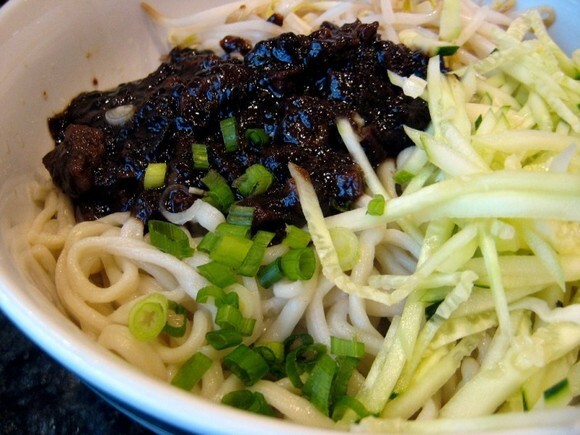 The most disappointing dish that we ordered were the Noodles with Bean Paste ($5.25). Thoroughly lacking in the funk department, the sauce was one-note and had us yearning for more oomph. I think a little fermentation would do the trick nicely. 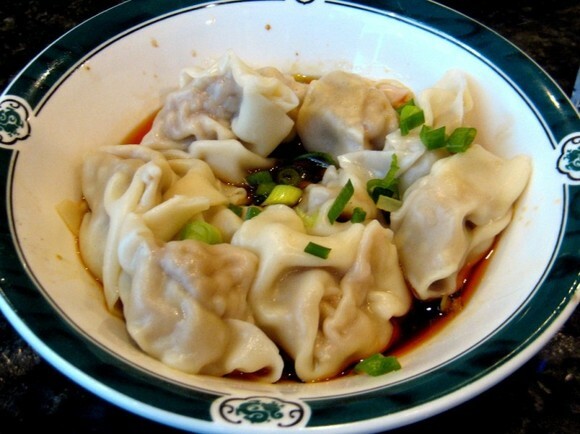 A bowl of spicy wontons came next. Drenched in chili oil instead of broth, this dish was solid and easy to love. The offals were the last to arrive. The pork kidneys ($6.95) weren’t as grainy as I expected them to be but tasted too strongly of iron for my taste. I prefer offals that are chewy and able to soak up flavors well. These kidneys tasted too much like themselves. The last dish of the night was fried intestines with Szechwan peppercorns ($6.95), which tasted pleasantly like fried chicken skin. I’m not much of a beer drinker, but this dish totally screamed out ‘bar food’. The Szechwan peppercorns left my mouth awesomely numb. Interesting. That intestine dish looks HOT, in a good way. 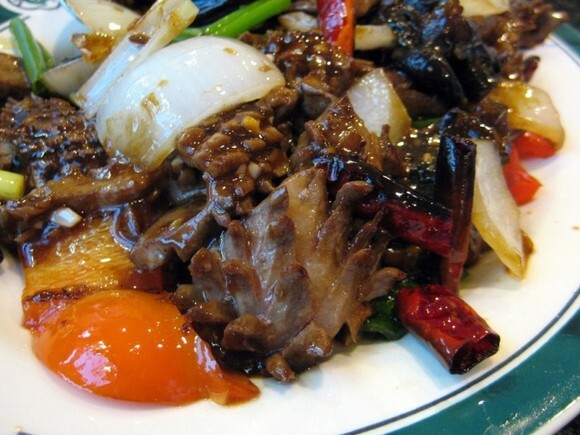 Did you see the post on Saigon’s Chinatown over at Eating Asia? Great photographs, though not of food, mostly. i *LOVE* mnemonic devices!!! they’ve helped me on many a college exam! i’d give this place a try, ‘specially since my fave place to get knife cut noodles–Heavy Noodling–closed a few years ago. Great review! I don’t know who came up with naming the restaurant but we should ask next time. 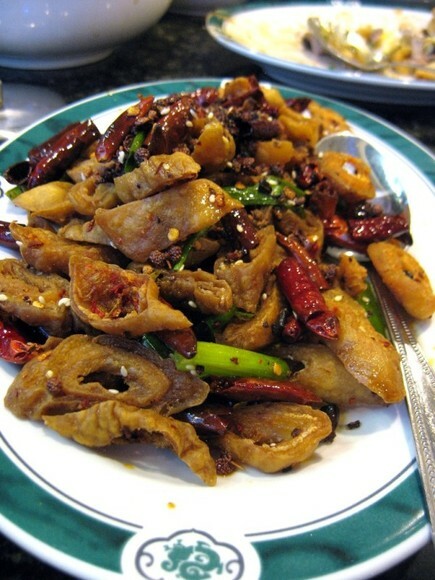 The picture of the fried intestines makes me hungry! 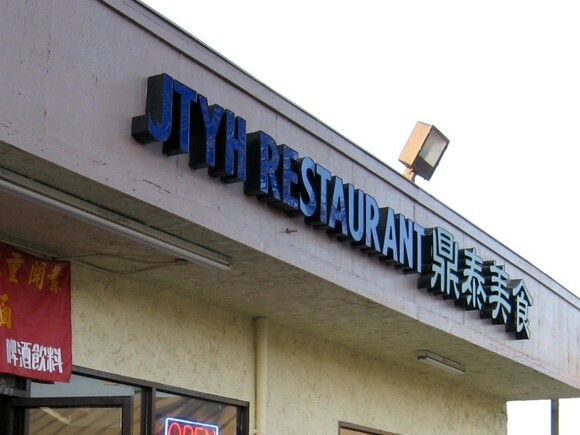 Pam: The flavors of JTYH were very similar to Heavy Noodling so I brought my mom there for a second visit. Through my mom’s use of Mandarin (which I lack), she uncovered that JYTH is Heavy Noodling! The UG girls loved it!